Ráda bych viděla vaše prácičky z mého nového freebie Dusky Lily (fialový). Těším se na vaše dílka! I would like to see your works from my last freebie Dusky Lily (violet)! I look forward to your creations! Hello there... I just created a layout, two background layouts and matching headers out of your superb Dusky Lily (my fav color) Hope you will like them all. 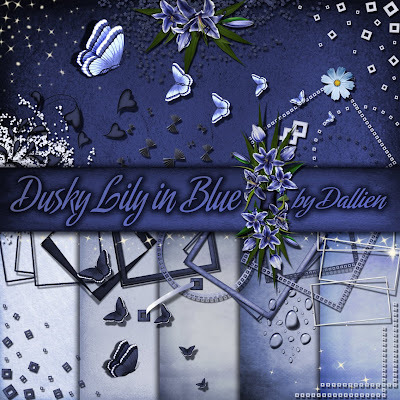 Hello there...thanks for liking all the layouts that I had made for you Dusky Lily. I made background layouts out of it and posted it in my site. Although I don't have any file-sharing yet (I don't know how to create one), I mentioned that if somebody out there likes the background layout, I can send it thru email. Somebody advises me that I have to ask permission from you if I intend to offer it as a freebie in my site. So sorry for the lapses. I was just so excited with my layouts. But anyway, is it ok to offer it in my site the background layouts that I had made? If not, its ok with me. I will just edit my post once you answered this note. Thanks again. You do such beautiful work... you are very talented!!! i love all of your Kit. Are so beautivul!!! I just felt that I would really like to leave a comment regarding all your kits!! I checked out your gallery and you are a truly amazing and talented woman!! Your work is amazing and I hope that I can someday make my digital layouts look as incredible as yours!! Keep up the great work and from a Mom on a tight budget with no funds for digital scrapbooking kits I thank you soo much for offering them for free.